Ian Murray released by the club as STV learns Garry O'Connor wants a big pay day overseas. 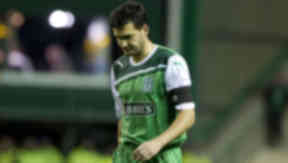 Hibernian club captain Ian Murray has left the club after being told his contract will not be renewed. 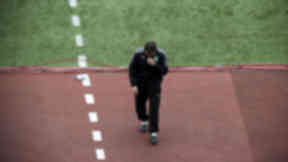 Murray sat out the weekend’s Scottish Cup final defeat to Hearts having failed to win a place on the bench for Pat Fenlon’s side. He now leaves Easter Road for the second time in his career. Murray joined Rangers on a free transfer in 2005 and played briefly for Norwich City before re-joining his boyhood idols at Easter Road in 2008. Murray is now eying a move abroad after admitting that his persistent hip injury played a part in him being out of favour with Pat Fenlon. Murray said: “I'd probably say the injury played a part, I haven't played more than 13 games this season so I can fully understand why it has happened. In saying that, I'm fully confident that everything has cleared up and I'll be in good shape for next season. "I had ten great years over two spells there and I'm just disappointed I didn't win any trophies over that time. "I don't know what's next for me. I get my last pay cheque next week then I am unemployed for the first time in my career. I think being able to fill in a few different positions could help me. "I have always fancied playing outside the UK but I have lots to consider with a young family. I think it could be the right time for me to go and live and learn from a different culture." Another Hibs player looking for a move overseas is Garry O’Connor. The striker is heading for the Easter Road exit after a year-long return to the club he began his career at. STV has learned that O’Connor has his heart set on a move abroad after taking a huge pay cut to turn out for Hibs following his release from Birmingham City. The striker, who hit 16 goals in a season that saw Hibs finish second bottom of the SPL and reach the Scottish Cup final, left for the first time in 2006 to sign for Lokomotiv Moscow in a £1.6m deal. The 29-year-old then joined Birmingham for £2.7m in 2008 after failing to settle in Russia. He is now out of contract and seeking a more lucrative deal away from Scotland.